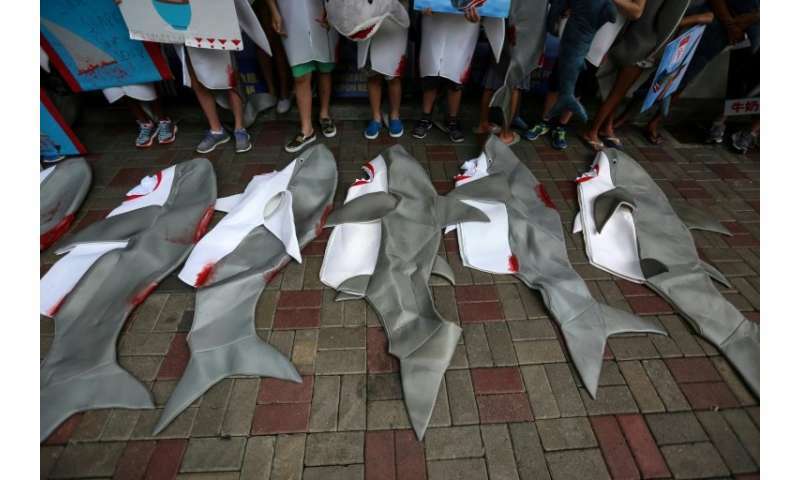 Environmental campaigners said Wednesday a hidden shipment of shark fins including some from endangered species had been shipped to Hong Kong via Singapore Airlines, despite a ban by the carrier. Hong Kong is one of the world's biggest shark fin trading hubs and it remains readily available in seafood stores and restaurants, despite pressure from conservationists and bans by some airlines and food outlets. US environmental group Sea Shepherd said the 989 kilogram (2,180 lbs) shipment had arrived in Hong Kong earlier this month from Colombo in Sri Lanka, via Singapore. It included fins from endangered whale sharks hidden among legal fins to avoid detection, the group said. Fins from endangered species require a special permit to be exported. "Singapore Airlines are yet another victim of these shark fin smugglers, who deceived the airline by declaring the shipment as 'dried seafood' to skirt the airline's internal booking checks," said Gary Stokes, Asia director for Sea Shepherd Global. Singapore Airlines, which banned the shipment of shark fin in 2014, said it had blacklisted the shipper. The airline added it had "sent out a reminder to all our stations" to conduct sampling checks on shipments made under the label "dried seafood" to ensure they did not contain shark fin. Sea Shepherd called for the Hong Kong government to tighten rules to combat wildlife crime and close loopholes which allow endangered shark fins to slip past inspections. Hong Kong has an unenviable reputation for trading in several controversial, banned or endangered commodities including ivory, shark fin, rhino horn and tiger parts. Critics routinely accuse the territory of failing to do enough to stamp out such practices. More than 70 million sharks are killed every year, according to the World Wildlife Fund. Huge quantities of fins are exported annually to Hong Kong and most are then sent on to mainland China. Hong Kong's consumption of sharks' fin soup has dropped over the years as activists campaign against the trade. The government in 2013 said it would stop serving sharks' fin soup at official functions as "a good example". Flag carrier Cathay Pacific banned the carriage of shark fins on all its flights in 2016.